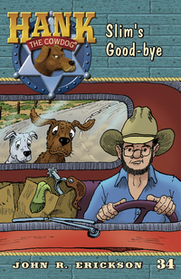 When the ranch falls on hard times in the winter, Slim the cowboy decides not to be a burden. Slim packs up and hits the road in search of another job. Hank and Drover hitch a ride, thinking they’re headed for town. Are they going to Canada? Are those penguins by the road? Will Hank have to get a new job as Head of Chicken Security? Hank and Drover find themselves stuck on Slim’s porch in the cold.